Whether your business is brand new, or just trying to compete in an ever-noisier marketplace, you need to get noticed! After all, customers can’t contact you if they don’t know you exist! With those basic steps, you can get started on public relations, right now, to start building your audience and target market. Ready to make your brand famous? Then read on and get even more great advice in our PR Playbook. You’ve probably heard of SMART goals or goals that are Specific, Measurable, Achievable, Relevant and Time-bound, but you might not be aware that countless studies have proven that when anyone has defined goals, they are significantly more likely to achieve them and much more productive than when they do not have defined goals. Your goals don’t have to be written in stone. You can review and revise them when you need to. But you should definitely set some at the beginning of your PR strategy and campaigns so that you have an overall direction to follow. Everything you plan and do from this point on should support these SMART goals. If it doesn’t then essentially you’ve lost your way and you are probably going to waste lots of time and money. If you’d like to learn more about setting SMART objectives, take a look at this great post from the SmartInsights team. We live in a noisy world. TV. Radio. Devices. Family. Friends. Work. Everything demands our attention all the time, so it’s no wonder we don’t have much room for anything else! That’s exactly why an effective PR strategy is based on a handful of core messages. People might not have time to take everything in all the time, but if they see the same messages repeatedly, they will take note. It’s why advertising is more effective if you have a big budget to run ads more frequently! Have you ever received junk mail that has absolutely nothing to do with you, and got annoyed or frustrated? You’re not alone. None of us enjoys having our time wasted by irrelevant issues. What you say is a big part of the battle. Who you say it to is an even bigger part! Knowing whether your ideal customer is a consumer or a business, who they are, what interests them, what they read and where they “hang out” online is a huge step in creating a successful PR strategy. Content marketers are masters at defining their audience, and organisations like the Digital Marketing Institute have some great tools and tips to get you started. Not only should your campaigns relate to your buyer persona, they should also consider their needs at each stage in the buyer journey. Here are some great content ideas for each stage of the buyers’ journey that you could promote with PR. If you’re in business, you deal with budgets and numbers all the time. Your PR strategy is no different. You need to know what you have to work with. Sometimes, particularly for new businesses, there is no budget at all. That’s okay too, as long as you’re honest about it, and understand that you can still “do” PR, but that there will be a lot more time and effort involved! 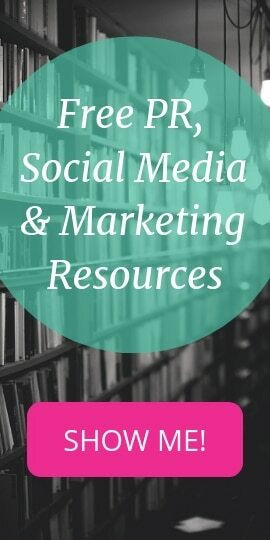 As part of this, you can utilise some really handy free PR tools too. If you do have a budget to spend on PR, monthly or annually, and you do want to outsource, most good PR firms will be honest and upfront about what your budget will cover. Once you know those details, you’ll have a defined starting point. If you need help deciding on your budget, a great rule of thumb is to allocate between 5% – 10% of the business turnover you are aiming for. 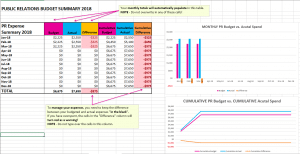 Then based on this budget, work out how you can allocate it to your marketing and communications efforts with our handy PR budgeting template. Unlike advertising, when you can pay an ad agency to say whatever you like, PR relies heavily on public interest. Press releases, for instance, must be newsworthy. They must be interesting. They must be timely, and most importantly, they must be relevant. From the topic of the release to the publication you send it to, always ask yourself if your news is relevant. If not, you may want to backtrack and rethink your strategy! To be successful in PR you need to be relentless in your pursuit of PR opportunities. Once you’ve followed the steps above you’ll have defined exactly who you are targeting and what problems and challenges they are trying to solve that your organisation can help them with. This sets the context for the opportunities you will look for, but how do you find those opportunities? Obviously, we can help you with that. It’s our job as the leading communications agency in Sydney to constantly find great PR opportunities for our clients and land great online and offline media coverage that increases their profitability. However, if you’d like to have a go yourself, take a look at our handy post about how to find more of the right PR opportunities for free. Planning is great, but don’t let your PR strategy get stuck in the planning stage too long! You’ve heard the saying “there’s no such thing as bad publicity”? Well, that’s not entirely true, but it can be said that any mention you manage to get in the media, even if it’s not perfect, is a step towards PR success. Public relations is cumulative. It’s a marathon, not a spring. Even if you manage only one successful piece of PR a month, you will see the effects over time, but the important thing is to make a start! Right now, sit down and create three newsworthy titles about your business that you can pitch to the press. Then list five news outlets who might be interested in your news. Write a press release for each of those titles, find the news submission area on the websites of the outlets you’re targeting, and submit them. If your press releases are interesting, relevant and timely, and you’re pitching them to the right people, there’s a good chance your release will get you the media coverage you want. Repeat this as often as you have news to share, and you should build a good foundation PR strategy without breaking a sweat. The final step in any kind of marketing, advertising and PR strategy should always be to measure results. Did your piece get media attention? How many people contacted you because of each piece? What sort of feedback did you get? A successful PR strategy will help to increase all of these things. If you don’t know how to track some or all of these things, get in touch and we can help you to work out a bespoke measurement and tracking system for your business. By taking this step at the end of any marketing and media outreach campaign, you can figure out what works, and do more of it. You can also stop wasting time and money on strategies that don’t work as well. Of course, public relations strategy is a huge topic, and fully developed campaigns have an enormous amount of moving parts that can’t be covered in just one post. It also changes all the time. That’s why PR professionals study their craft and continue to learn new tactics and strategy throughout their careers. The beauty is, you don’t have to know everything to get started, and there are resources (like our blog and newsletters) that can help you to get started on your own PR strategy, no matter what stage of business you’re at. We’d love to hear about your triumphs or challenges too, so be sure to sign up and comment!